The International Charter on Space and Major Disasters swung into action to aid emergency response to the recent wildfires in the north of Israel. CNES coordinated operations to rush satellite imagery to field teams. 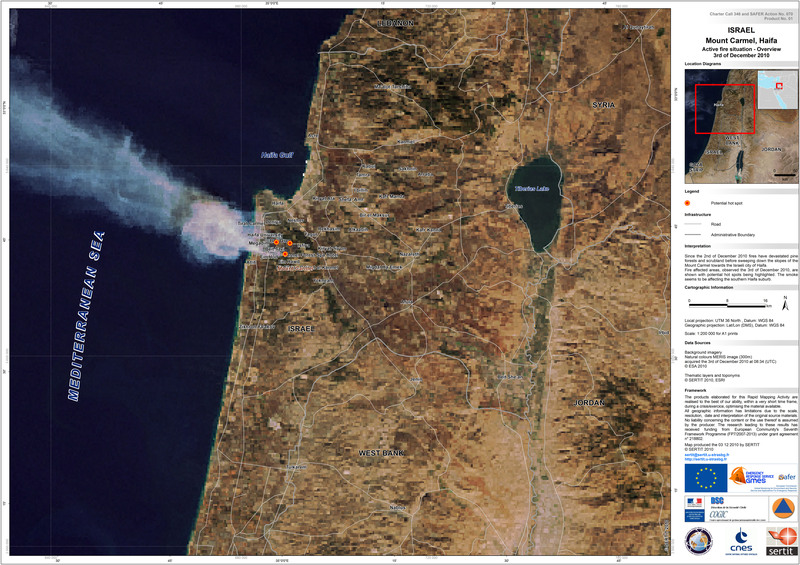 Map of active fires on 3 December on Mount Carmel, Haifa (1:200 000). Credits: SERTIT 2010. Wildfires broke out in Israel on 2 December. The next day, the French civil protection directorate (DSC) activated the International Charter on Space and Major Disasters to get satellite imagery to its teams organizing operations in the field,” recounts Catherine Proy, CNES’s Charter representative. Every time the charter is activated, member space agencies task their satellites and domain experts to supply, free of charge, emergency satellite imagery to relief teams. 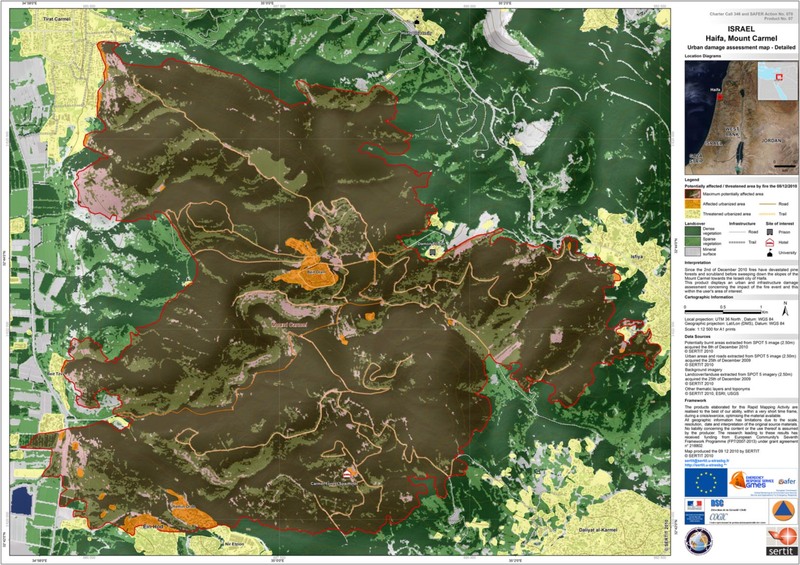 This time, the Landsat, ALOS and SPOT 5 satellites trained their sights on Mount Carmel, where the forest was ablaze. Sectors potentially affected by Mount Carmel fire, Haifa, Israel. Credits: SERTIT 2010. Catherine Proy, CNES’s International Charter representative. Credits: CNES. "Only hours after activation of the charter, basemaps were supplied to French emergency responders on the ground. And on the morning of 5 December, just 48 hrs after activation, they received their first crisis maps to locate burning fires and fire-affected areas,” says Catherine Proy. Detailed view of fire dynamics derived from a Landsat 5 image of 3 December 2010, a RapidEye image of 4 December 2010 and a post-fire SPOT 5 image acquired on 8 December 2010. Credits: SERTIT 2010. While CNES coordinated acquisition of satellite imagery and other operations, the SERTIT2 mapping centre in Strasbourg, France, produced crisis maps. “With the French civil protection directorate, we form a very effective trio working round the clock,” stresses Catherine Proy. These high-resolution maps, updated as fresh satellite imagery was acquired, were used to pinpoint active fire hotspots, track fire spread, locate useable roads and tracks, and identify houses in the fire’s path. This kind of information is vital to help emergency responders organize operations and reach people in danger as quickly as possible. Detailed view of the fire’s potential impact on built-up areas. Credits: SERTIT 2010. These maps were produced with support from the European GMES/SAFER3 programme. “This charter activation illustrates the successful cooperation between member space agencies and the synergies between the charter and the pre-operational GMES emergency response service,” concludes Catherine Proy. 1 ESA, CNES, CSA (Canada), NOAA/USGS (USA), ISRO (India), CONAE (Argentina), JAXA (Japan), BNSC/DMC (United Kingdom) and CNSA (China). 2 Service Régional de Traitement d'Image et de Télédétection (regional image processing and remote sensing department). 3 Global Monitoring for Environment and Security/Services and Applications For Emergency Response.